Local electronics giant Cherry Mobile is set to slash Php 700 off the price tag of the best-selling Cherry Mobile Flare Lite (which - with regular SRP of Php 2,699 - is already the most affordable Flare smartphone in the company's line-up) making the handset even more wallet-friendly. Targeting young, budget-conscious consumers who want to experience the wonders of an Android smartphone for less, the Flare Series remains to be Cherry Mobile's most popular device line to date. In 2014, both CM Flare 3 and Flare 3X became monster sellers for the Pinoy handset maker, helping to catapult the brand to its best year yet in terms of sales and giving it the number one position in the local handset race. 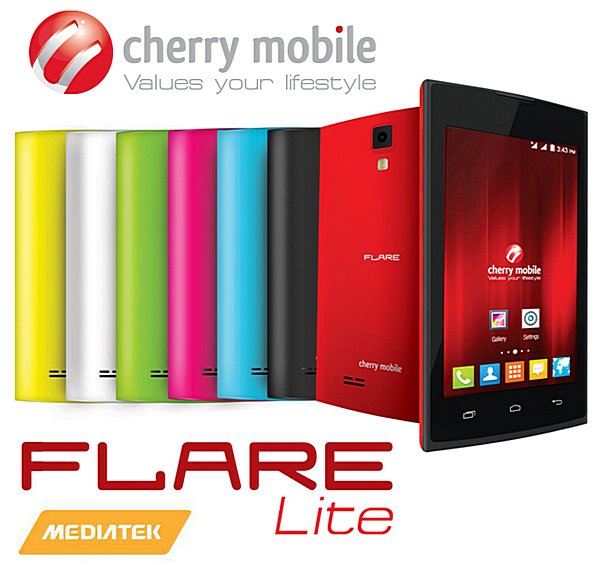 Launched in November 2014, CM Flare Lite - as its very name suggests - is not as powerful as those two above-mentioned models but for its price, its specs are actually decent enough to provide consumers with a good mobile experience. The phone is equipped with a 4-inch capacitive touchscreen display, a 5 MegaPixel camera with LED flash, 2 MegaPixel front-cam for selfies, Dual SIM Dual Standby capability, 3G HSPA+ support, and a 1,300 mAh battery pack. Underneath its colorful shell, the device runs vanilla Android 4.4 KitKat with its Dual Core 1 GHz ARM Cortex A7 and Mali 400 GPU based MediaTek MT6572 chipset, has 512MB of RAM, and 4GB of storage that can be expanded via microSD card slot. Again, these specs aren't much but when you consider how affordable the handset is, it's really hard to complain or to unfairly criticize what it has to offer. 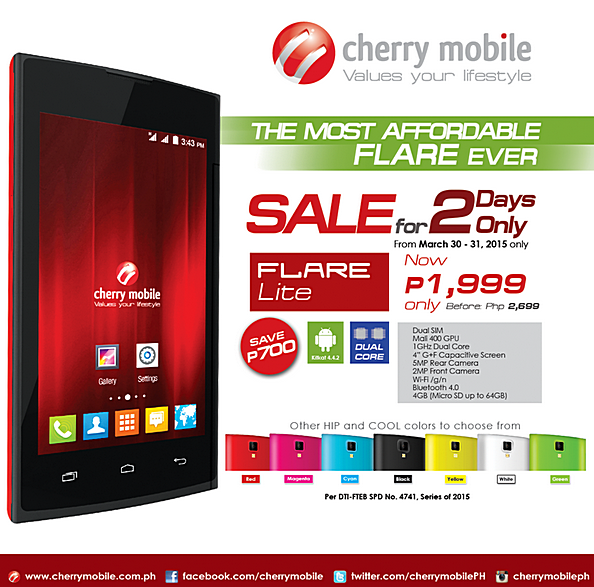 From March 30 to 31, 2015, you can get Cherry Mobile Flate Lite for only Php 1,999 (instead of Php 2,699) at all Cherry Mobile Concept Stores, Kiosks, and Authorized Retail Partners of the brand. The phone is available in a number of youthful hues, namely, Red, Magenta, Cyan, Yellow, and Green, apart from the usual Black and White.